Expert lawn care tips are included with the Chinch Guard chinch bug pesticide, the non-toxic environmentally safe chinch bug solution from Planet Amazing. The report is called Lawn Care Secrets, and is written by expert lawn care specialist Justin Douglas from Planet Amazing. A new, free bonus report is included with the Chinch Guard product from Planet Amazing. The report is called Lawn Care Secrets, and is written by expert lawn care specialist Justin Douglas from Planet Amazing, who says "I will show you what the difference is between you and the most meticulous lawn care, and teach you step-by-step what you can do to create an immaculate lawn or garden. These simple, easy, and time-saving tips are secrets used by the pros for years! I have worked with gardeners, lawn care experts, and landscapers to show them the most efficient, long-lasting, and easy secrets to creating a beautiful outdoor world. I was able to help them, so think of what I could do for you." Mr. Douglas says that a second aspect of lawn and garden care is dealing with pests, and that recently there has been more publicity about the immunity that insects are developing towards traditional chemical pesticides. "It is common to hear that pesticides are not working on insects like they did in the past, because the insects are building up an immunity to chemicals. At Planet Amazing, we use only non-toxic solutions, and our main pesticide products use a solution that is not a chemical at all, and which insects cannot resist. The microcrystals technology will work with these insects to keep your lawn and garden safe, and it is a white fine powder which is safe for pets, humans and plants, but fatal to harmful insects. It is a non-toxic chinch bug cure"
Mr. Douglas says the lawn care report comes with Chinch Guard, a microcrystals-based s olution for killing chinch bugs. 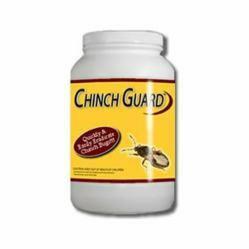 He says Chinch Guard is also essential in areas where chinch bugs live, and that other methods have been found to be ineffective: "baits and traps are ineffective because, while they may trap some, you are missing the majority of chinch bugs. Chinch bugs cannot be baited because they are foragers—they simply wander until they come across food, which is why baited traps are useless. And, as with spray insecticides, you are risking poisoning your children and pets. Extermination companies are an option that works to kill chinch bugs. But, there are several drawbacks to this option as well. Most chinch bug exterminators rely on even more powerful and potentially dangerous chemicals while practicing their craft. Moreover, the chemicals they use can’t even be purchased without a restriction EPA license. That means the EPA doesn’t allow non-licensed people buy it publicly. That has to tell you something. Further, these services are very expensive and often require a service agreement for 1-2 years." The free report is available when buying Chinch Guard from the main website at http://www.chinchguard.com.